Feathers require constant care! In order to maintain their plumage, birds “bathe” to clean their feathers and rid them of parasites. Where water is available, birds bathe in water. In arid regions dust replaces water for feather grooming. Many birds will bathe in water followed by a dust bath. Birds bathe throughout the year, even in snowmelt. There are several ways that birds approach the task of bathing in water. One way is the “wading method”. The bird stands in water, fluffs its feathers to expose the bare skin between the feather bases and then flick its wings in the water. The bathing bird submerges its breast and rolls back and forth. Then it throws back its head to douse the feathers on its back. This process may be repeated several times before the bird deems itself finished. Leonard and I just returned from a short camping trip to Lassen Volcanic National Park. Early one morning I watched several dark-eyed juncos (Junco hyemalis) bathing on the shore of Manzanita Lake. It was cold and I was surprised the little juncos were in the water. They could have waited until the sun came up and temperatures rose. 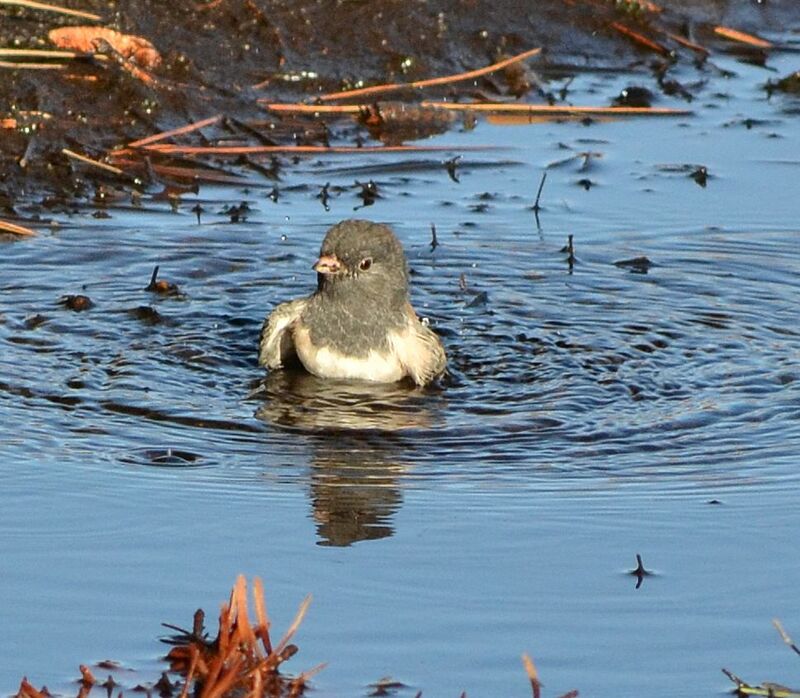 Although I have pictures of the juncos’ entire bathing sequence, for now I only want to share this one photograph. I think this little guy is so adorable sitting in the water. He needs to stand alone! This entry was posted in Birds and tagged Dark-eyed Junco, dust bath, feathers, Junco hyemalis, Lassen Volcanic National Park, Manzanita Lake, photography. Bookmark the permalink. I’ve seen birds bathe before, but have never really paid attention to it: will do so next time. Thanks for sharing. Watch closely sometime, it is fascinating!